Our Community Health Centers (CHC) depend on federal funding that will be cut by 70% if Congress does not pass legislation by the end of this month. If the legislation is not passed, the CHC will lose $1M in funding starting in March. This is roughly 1/7 of our budget and would result in our losing the ability to care for 1,500 patients (see the infographic below). Use this toll-free Advocacy Hotline 1-866-456-3949 to call your Members of Congress and deliver the request: act immediately to fix the cliff. 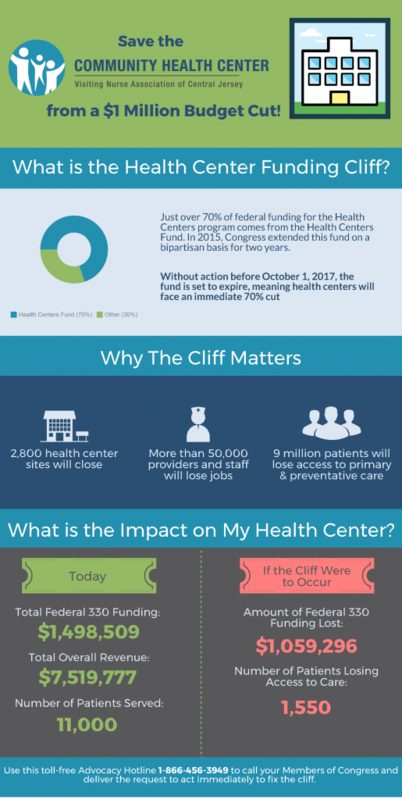 Last, after you have emailed and called, we ask that you post a message on social media directed to your Member of Congress to let them know how the cliff will affect your health center and the patients you serve. In order to move Congress to act this month, we need to produce tens of thousands of messages. Help us give a voice for our Health Centers and the patients we serve!